Journalism students at Olivet School of Media and Communication (OSMC) explore using mobile phones for news reporting in the multimedia journalism course this quarter. The multimedia journalism course is designed to give students a broad perspective and practical experience in the emergence of new forms of journalism. Students will learn to produce digital multimedia journalistic pieces that combine text with still photos, audio, video, and infographics. Reporting with mobile phones, in the context of multimedia journalism, is highly applicable. First of all, mobile phones become very handy in a breaking news situation where immediacy values most. Secondly, the pictures, videos, and audio recorded right at the scene with mobile phones are readily shared in their forms across various digital platforms. During the multimedia journalism class, students watch demos and tutorials on how to take better photos with their smartphones. Many of them are amazed by the full capability of the camera on their mobile phones. They also learn some techniques of storytelling in an audio-only format. 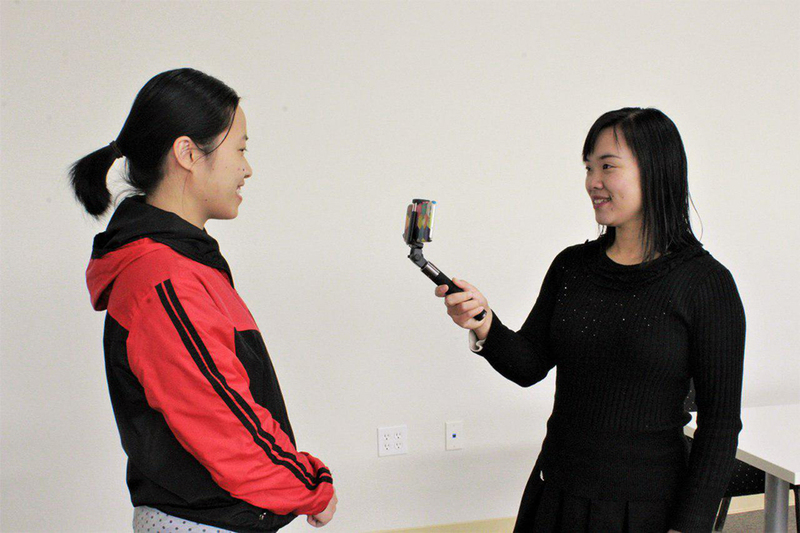 Media student Abby Peng produced a 2-minute audio clip reporting on the recent Lunar New Year celebration by international students. The festivities becomes live and vivid in the clip through her mastery of voice and recording of sounds at the scene. “It is my first time reporting with audio only. I thought it was very new and a fun experience for me. The class has given me inspirations to produce new forms of reporting that is not just informative, but effective and desirable,” Peng said. Besides still photos and audio, the class introduces the basics of video news production such as shooting a video sequence and conducting interviews on camera. By applying some professional techniques in photography, students are able to produce video stories with their smartphones. “While using professional gears for news production gives us the best result, it is also true that mobile journalism has its merits, especially in the multimedia capabilities. It is important for journalism students to sharpen their skills in this area,” course instructor Eunice Or said.